Sports and Fitness is a one-semester course with no prerequisites, available to juniors and seniors. It is expected to be offered to students for the 2019-2020 school year. Teachers of this course have not yet been determined. 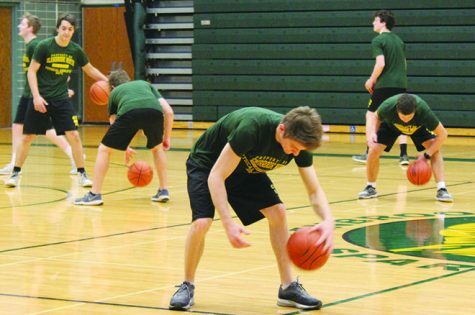 According to Bob Pieper, instructional supervisor for physical education, Sports and Fitness includes activities from Lifetime Sports and Conditioning and Team Sports and Conditioning that students have enjoyed, along with a fitness component. Lifetime Sports and Team Sports will no longer be offered as separate P.E. classes starting next year. Pieper said he wants to see students taking a variety of P.E. classes, and when students can take both Lifetime Sports and Team Sports twice over the course of their junior and senior years, they are unable to experience other classes. Students are only able to take Sports and Fitness twice between their junior and senior years. Total Body Conditioning is a one-semester course set to be offered starting in the 2019-2020 school year. It is available to juniors and seniors and does not have any prerequisites. P.E. teacher Beth Figaro–Brandt, who is set to teach this course, said it is similar to classes available at fitness clubs or studios, as it involves skills such as endurance training, abdominal work and toning exercises. “The thing about fitness is that you have the opportunity to work at your own pace [and] level by choosing the amount of weights you may be doing,” Figaro-Brandt said. Advanced Data Structures and Algorithms, a full-year, honors-level course, is expected to be offered to students at the start of the 2019-2020 school year. Students must take AP Computer Science A as a prerequisite and have a recommendation from a computer science teacher. Steve Goodman, computer science and math teacher, is set to teach the class. Goodman said the class will correspond to a second-level computer science course in college even though the College Board does not offer an AP test tailored to this class. The course will mainly cover ways to hold collections of data, which are data structures, and algorithms, which involve processes such as searching or sorting, according to Goodman. “[This class] is designed for students who have a lot of interest in computer science [and] the desire for more,” Goodman said. Junior Thane Gesite, who is currently taking AP Computer Science A, said she plans to take the class next year because she has always been interested in computer science. She thinks it is very useful in career pathways, as it can be applied to different fields of study. The Organic Chemistry class is a regular-level, one-semester course offered only during the summer, beginning in 2019. A chemistry class is required as a prerequisite, so it is available to juniors and seniors. Science teacher Marcel Grdinic, who is expected to teach the class, said it will build on chemistry skills students learn their sophomore year, focusing on the subdiscipline of organic chemistry, the study of carbon compounds. It will involve a different way of “playing around with atoms and molecules” than taught in inorganic chemistry. “I hope [from taking Organic Chemistry] someone can take away … an appreciation for how varied the world is in terms of the number of compounds, and how many humanity has created,” Grdinic said. Sophomore Yoel Gros said he is interested in taking Organic Chemistry because he may pursue a chemistry major in college. History and Philosophy of Science is set to be a semester-long, regular-level course offered only during the summer, beginning in 2019. The class has no prerequisites and will be open to all students. Grdinic, who plans to teach the class, said philosophy will be applied to the study of science to learn how science has evolved through history.